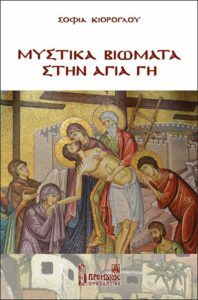 This entry was posted in A tribute to the Holy Land, Βιβλίο της Σοφίας Κιόρογλου, News from Athens, Personal poems, Poems inspired by Jerusalem, Published work and tagged News, PAGE AND SPINE. Bookmark the permalink. passing a couple of times in front of me. he wore a green t-shirt and a backpack on his shoulder. and no nepenthe for his pain. I was sitting with my man on the bench. hey did you just see Christ? it was Christ and I praised him ..
What if he didn’t have a home? This entry was posted in A tribute to the Holy Land, Βιβλίο της Σοφίας Κιόρογλου, Poems inspired by Jerusalem. Bookmark the permalink. Another poem live at WINAMOP!Thank you, Dave! This entry was posted in A tribute to the Holy Land, Best poems, Personal poems, Poems inspired by Jerusalem and tagged Published in Winamop. Bookmark the permalink. This entry was posted in A tribute to the Holy Land, An article by Sofia Kioroglou, Personal poems, Poems inspired by Jerusalem and tagged Promachos. Bookmark the permalink. In shemayim, the sinners can enter through Your son’s atoning death. This entry was posted in A tribute to the Holy Land, Poems inspired by Jerusalem, Published work and tagged The Outlaw Poetry Network. Bookmark the permalink. This entry was posted in A tribute to the Holy Land, FRACTAL, Poems inspired by Jerusalem and tagged PAROUSIA Magazine. Bookmark the permalink. Το Μπετ Σαχούρ είναι το χωριό των ποιμένων. Ο Αρκούλφος ιστορικά είναι μεταγενέστερος προσκυνητής στον Ναό του Μπετ Σαχούρ. This entry was posted in A tribute to the Holy Land, Poems inspired by Jerusalem, Published work. Bookmark the permalink. Read my two spiritual poems alongside Christine Tabaka in the second issue of Labyrinthine Passages. A special thank you to the Editor for the wonderful selection. This entry was posted in Poems inspired by Jerusalem and tagged Labyrithine Passages. Bookmark the permalink.